Modal verbs are a kind of auxiliary verb. They facilitate the main verb for suggesting potential, expectation, permission, ability, possibility, and obligation. When used with the main verb, modal verbs do not end with -s for the third-person singular. Modal auxiliary verbs never change form, but they have a different form for past tense. NB: The words in parentheses ( ) are semi-modals. They have the same meaning, but they are different grammatically. Will indicates a ‘willingness’ to do something in the future. The negative form of will – will not (won’t)indicates an ‘unwillingness’ (refusal, reluctance) to do something. I will give you another opportunity. They will arrive at 10 AM. Would indicates general or repeated willingness in the past. It also indicates preference in the present. If you did not leave, I would still be taking care of you. Whenever I had to go there, they would throw a party. We thought that people would buy this book. I would like to make a toast. Used to sometimes replaces would but sometimes it would be grammatically incorrect if we use used to in place of would. When I was in school, I used to make sketches. He often used to cry at night without reason. I used to take a break at this time of the year. These modals express possibility and ability. Can indicates ability. Could indicates ability with an option. Can & could also indicate possibility. The temperature can rise this month. They can’t go too far by now. May and might both indicate possibility but might can suggest that there is less possibility than may. Alex must go home by 6.00 pm. Have to has a similar meaning to must but implies less urgency. Alex has to go by 6.00 pm. Should indicates obligation and probability. You should come home early. You should not smoke at all. I should visit my parents more often. Ought to and had better sometimes replaces should. You ought to come home early. I think parents ought to give children more freedom. (Had better won’t be appropriate here. Modal verbs are a kind of auxiliary verb. They facilitate the main verb for suggesting potential, expectation, permission, ability, possibility, and obligation. When used with the main verb, modal verbs do not end with -s for the third-person singular. 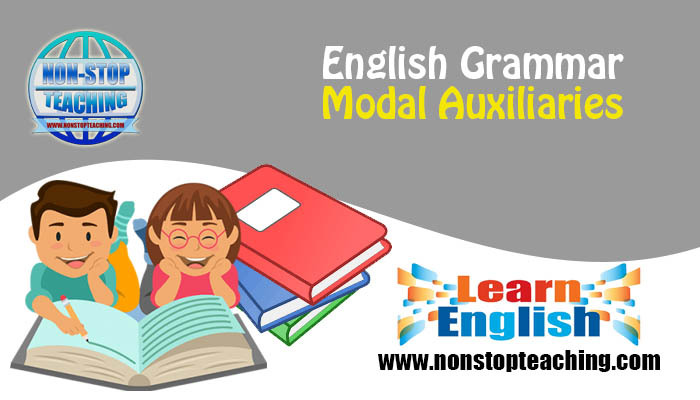 Modal auxiliary verbs never change form, but they have a different form for past tense.